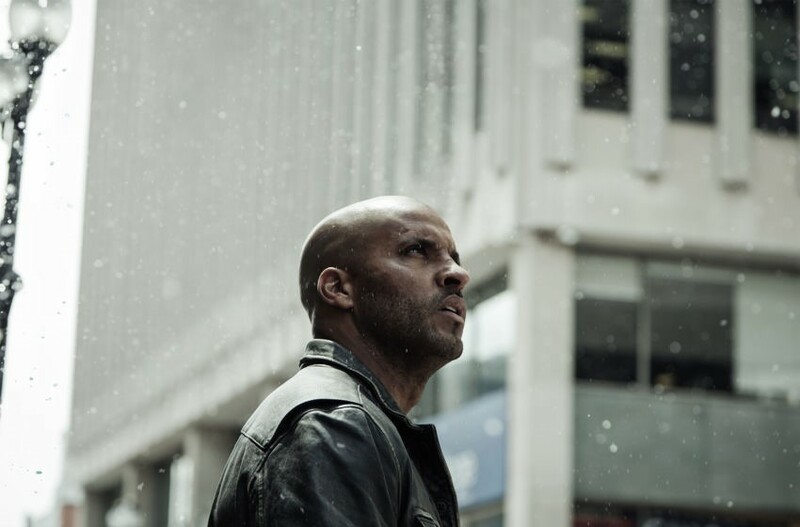 This week on American Gods: jinn drive taxis and gods weigh hearts, Shadow Moon is still struggling with his hold on reality, Mr. Wednesday still doesn’t understand why anything should be a struggle, and someone takes the moon. We learn how stories can be a way of believing, and how belief can change the world, or just make it snow. Also: there is a storm, a bank robbery, and a visitor. We don’t get a story of gods coming to America to open the episode this week, but we do get two stories of gods (or the godlike) already here. The Somewhere in America tales of the previous episodes have centered around Bilquis, the unhappy goddess of love and lust whose particular form of worship gets all the buzz online. Like Bilquis’s scenes, those during this week’s episode serve to remind us that the adventure of Wednesday and Shadow isn’t the center of everything. The gods living in America have been living in America — have been making their living in America — for years already. They come here, and here they wait to be worshipped, or to be believed, or to come to life in the stories mortals tell. If I had to pick some connecting thread between the two Somewhere in America segments of this episode, I think it might be the power of stories. Just as the Vikings tied their god to the land with sacrifice and war, some gods or beings of myth are tied to the land and its people with stories. Stories, like prayers and sacrifices, hold power — perhaps because someone must believe in them to tell them correctly, even if that belief only lasts for the time of telling. Somewhere in America a woman named Mrs. Fadil is making dinner for her family when she gets a knock at the door. The man on her doorstep tells her that he is of Death, and she has died. Upon realizing the truth of what the man says, Mrs. Fadil is confused: she is a Muslim woman, but the scene playing out is not one that follows the faith she believes. He tells her that her grandmother used to share stories of Egyptian gods, and Mrs. Fadil believed those stories when she was young, then remembered them throughout life. For that, she gets to go with Anubis, the Egyptian god of the Afterlife, and have her heart weighed against a feather. Anubis takes Mrs. Fadil to an absolutely breathtaking landscape of desert and colorful, starry sky. They sit down next to a set of scales and he reaches into her chest to rip out her heart so that her life can be measured in the Egyptian way. As soon as her heart is on the scales, Mrs. Fadil begins worrying about all the bad things she’s done in her life, but the scales even out and prove that she lived well. She’s allowed to choose her next world. Unable to decide between five doors to different afterlifes, she turns to Anubis to decide for her, and then, when she hesitates, the cat that had followed them both just pushes her through the door he opens. Cats: kinda jerks, even in the place between life and death. Somewhere in America, a man named Salim is living an unhappy life selling junk, or trying to — no one will see him or listen to him, and they certainly won’t give him their money. He tries smiling his way through it, but it’s clear that unhappiness is dragging him down. Then he meets a man driving a taxi, who speaks his language and of ancient cities long gone, and who hides eyes made of burning flame behind a pair of cheap plastic sunglasses. Salim’s grandmother used to say that she saw an ifrit (a kind of jinn) on the edge of the desert, and clearly something about that tale had stuck with Salim because he doesn’t seem too shocked to find a jinn driving a taxi. After commiserating over life in America — Salim’s miserable experience as a salesman and the Jinn’s miserable experience driving a cab in a country he’d been dragged into through stories — Salim invites him into his hotel room and his bed. When Salim wakes up the next morning, all that’s left of the Jinn is his wallet and ID, the keys to his cab, and his black sunglasses. Salim, I suppose, will try a new life driving a cab — and though the Jinn hadn’t exactly made that occupation sound glamorous, Salim seems happier on his new path. I guess both these Somewhere in America asides had an idea of comfort at the core of them. Mrs. Fadil finds comfort in the terrifying afterlife by allowing Anubis to choose her path for her, while Salim and the Jinn find comfort in each other. Shadow wakes up when he senses someone go through the living room, where he’s sleeping on the couch, and climb out the window of Czernobog and the Sisters’ apartment. Probably mimicking Mrs. Fadil’s climb out her fire escape, up her building, and into Anubis’s world of desert and starry sky, Shadow climbs up the ladder of the building and onto the roof, where a sky full of unearthly bright stars and looming storm clouds are overhead. Also there on the roof is Zorya Polunochnaya, the sister who had been sleeping since Shadow and Mr. Wednesday had arrived. To help Shadow, Zorya Polunochnaya trades a kiss for the moon — a silver coin that she pulls from the sky, then tells him not to lose or give away, like he had given away the sun before. Shadow has no idea what she’s talking about, of course, and wakes up on the couch in the house, where there is no ladder to the roof from the living room window but there is a silver coin in his pocket. Shadow goes to Czernobog’s room and makes another bet over a game of checkers: if Shadow wins, Czernobog meets Wednesday in Wisconsin; if he loses, Czernobog gets two hammer swings in case the first swing doesn’t kill Shadow outright. Gods must be creatures of habit, because Czernobog tries playing the exact same game he played against Shadow before. Shadow is able to beat him this time around. He will still get his head smashed by Czernobog’s hammer, but Czernobog must wait until after Wednesday’s scheme is complete to do it. The next morning, Wednesday tells shadow that they’re going to rob a bank. They check out the bank (and are checked out by the bank’s security system, which also features some shadows and an eye that looks curiously like Media’s). Wednesday tells Shadow that they need snow to help them rob the bank, then asks that Shadow think of snow. While waiting for some business cards and signs to be printed up, Shadow thinks of snow — and lo and behold, it snows. He questions this later at lunch with Wednesday, telling him that it was never supposed to snow, but he thought of snow and it started to snow. Once again, Shadow finds himself torn between believing in the world he’s always known and the world that Wednesday is showing him exists. Shadow’s day isn’t exactly improved by the appearance of Mad Sweeney, looking for that gold coin he gave Shadow after their fight in Jack’s Crocodile Bar. That was his lucky coin, he tells Shadow, and Shadow informs him that he threw the coin away. According to Shadow, it’s now on Laura Moon’s grave in Eagle Point, Indiana. Mad Sweeney storms off to get his coin back, and Shadow goes back to contemplating the difference between reality and delusion, and which one he might be experiencing. The bank robbery isn’t so much a bank robbery as it is a bank misdirection, as Wednesday tapes up a few Out of Order signs and puts on a security guard uniform and pretends that the bank’s deposit slot is closed. People just hand the money over to him, and though police do show up, they’re just worried about a single man handling so much cash. Shadow pretends to be Wednesday’s supervisor, getting into the character Wednesday provided him. Everything turns out fine. Shadow still protests the idea that he made it snow, but can’t help admitting that nothing about his life feels like a delusion. Instead, it feels like a dream (“What a beautiful thing to be able to dream when you’re not asleep,” says Wednesday). Wednesday switches tactics by asking if Shadow believes in love. Shadow does believe in love, but he didn’t before Laura — which means that Shadow didn’t believe until he did, “and then the world changed because [he] believed.” Belief, it seems, has the power to change everything. In Eagle Point, Indiana, Mad Sweeney is digging up Laura Moon’s grave, only to find an empty casket with a perfectly circular, coin-sized hole burned through it. When Shadow returns to his hotel room, his dead wife is sitting on his bed. She says hello. Not that I like thinking about his death, but if all you need to get into a different faith’s afterlife is to tell some stories about their gods, I guess Neil Gaiman’s going to be spoiled for choice. “Got you marshmallows in your cocoa, you like marshmallows?” “Why are you talking to me about marshmallows? Like I’m worried about marshmallows! ... Yeah, I like marshmallows.” The petulant child tone just sells that line. “So you’re perfectly okay believing that tiny people on television can predict the weather, but you crinkle with consternation at the mere suggestion that you could make it snow.” My favorite thing about Wednesday is how he manages to make nonsense sound sensible.